Welcome to Crete Park District! We're glad you're here! Crete Park District hosts fun programs for kids and adults. We pride ourselves on our Athletics, Preschool, Early Childhood Education, Fitness, Kids Korner, and a plethora of Special Events for every season! Crete Park District is a fun and safe environment for people of all backgrounds. We strive for diversity to represent our amazing community. Crete Park District was founded in 1957 and since then we have grown tremendously. We love adding new additions to our family. We host several, fun and engaging programs for people of all ages, from tots to seniors. We work hard to accommodate all people. Make Crete Park District your home away from home today! NEW! JUST ADDED! OPEN GYM ON WEDNESDAY, 4-5 PM AT BALMORAL ELEMENTARY SCHOOL, MONEE ROAD IN CRETE. (Use west door!) February 27th through April 1st, ages 6 & Up can join us every Wednesday from 4-5 pm. There is no registration required but there is a $3 fee to pay at the door. Adults accompanied by a child are free & under 10 must have an adult present. Bring a basketball, volleyball, your friends or just yourself and enjoy! We will have staff supervising, so bring the kids! Check out our Spring Flier HERE~! The Summer Camp information is Available HERE! Registration will begin May 1. The Summer Programs will be listed on this website beginning April 17th. Below is the PDF of the Brochure. We hope you will find several programs to make your family happy and healthy and join us soon! Check out the Winter Spring 2019 Brochure! Watch for our Summer Brochure which will be mailed around April 30th. Crete Park District will be holding the grand opening for the Rotunda, a new rental space, located at Heritage Park, 1550 Sangamon Street in Crete. The area seats 40 and has plenty of amenities to make your party easier for you and amazing! Watch our Facebook page for previews of programs coming soon!
? How about the gift of fun? We know fun means different things to different people and have developed a list of things for ages 3 through adult. New programs will be released online with several new and exciting opportunities for someone you care about. Gift certificates can be purchased in any denomination. 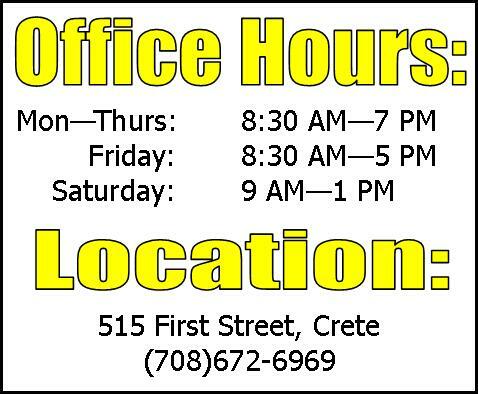 Give us a call at (708)672-6969 and we will have it ready when you arrive at our office at 515 First Street in Crete. There are several easy ways to register for our programs. Feel free to complete our registration form found HERE, scan and email to thale@cretepark.com, fax to (708)672-6945, bring it by our office or mail it to 515 First St, Crete. We accept cash, check, Visa, Mastercard, & Discover Card. If the office isn’t open, feel free to drop your form and payment through the mail slot to the right of the front door. If you are a Resident & haven’t registered since Sept 2011, you must present a valid drivers license or picture ID to receive the resident discount. Thereafter, you are welcome to register on-line at CretePark.com or through the mail. Receipts will not be mailed, but feel free to give us a call at 708-672-6969 to be sure your registration was processed! If you send it by email, we will respond to let you know we have received it. We process our emailed registration Monday - Friday. We also have evening and weekend hours to accommodate working parents. If you have any questions, give us a call at (708)672-6969. See you soon! Keepin' Up with Crete Park! Our email list will help you stay up to date on program changes and NEW programs we are starting between brochures. We also send all of our COUPONS through our emails. To sign up, complete the form on the left or the click on the QR Code below. We will never share ANY of your information and promise not to fill your inbox with an excessive amount of emails! Join us and stay up to date! Sign Up for Coupons & Updates!